citrus | "blackberry-eating in late September"
It’s citrus season. The trees are heavy. An amble through my neighborhood right now would send you past oranges, mandarins, tangerines, lemons, and who knows what other hybrids and splices, all sagging on their branches, almost unable to bear their own weight. When we first moved here in the summer of 2012, I couldn’t believe how much fruit was wasted. Who in their right mind could let it just fall to the ground and rot? And yet as I type, my own lemon tree – sequestered away in its little corner of our backyard – is groaning with a load I can’t reach, its thick, sharp tangle of twigs protecting it from an invading ladder. So when I cast about for a subject to post about this week, you’d think I would have wandered out and reached up, pulling what fruits I could reach down from my own harvest. But lemons aren’t my favorite. Oh I love a fresh, pulpy lemonade. I could eat lemon curd straight out of the jar. And a tiny, hangnail-puckering squeeze into a chicken or a bean dish is almost essential. But if I’m going to celebrate citrus season and its glories, I’m going to go with my favorite: grapefruit. Sometimes maligned for its stubborn, bitter pith and its curious ability to render certain drugs either useless or too effective, it is my favorite because it is so complex. Sweet, tangy, sour, infernally juicy, it, and not orange juice, is my choice of beverage when I’m sick. I love the smell of the peel under my fingernails. 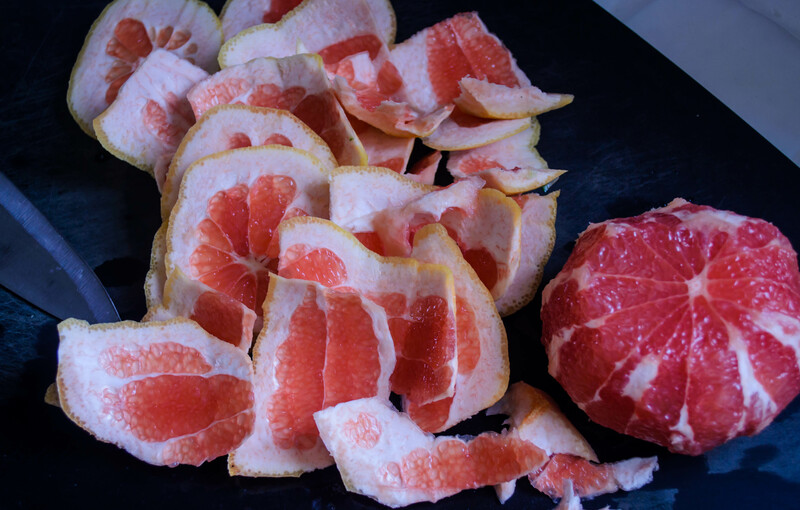 I could eat grapefruit (and have) until my tongue stung and my lips swelled with the tartness. But if grapefruit is a bit testy as a raw product, it’s equally challenging in a dish. There are (at least compared to other citrus fruits) a paucity of grapefruit dessert recipes out there, which has always seemed like a shame to me. The lovely play of sweet and sour with that beautiful color (I prefer a red grapefruit myself) seems perfect to match with sugar. 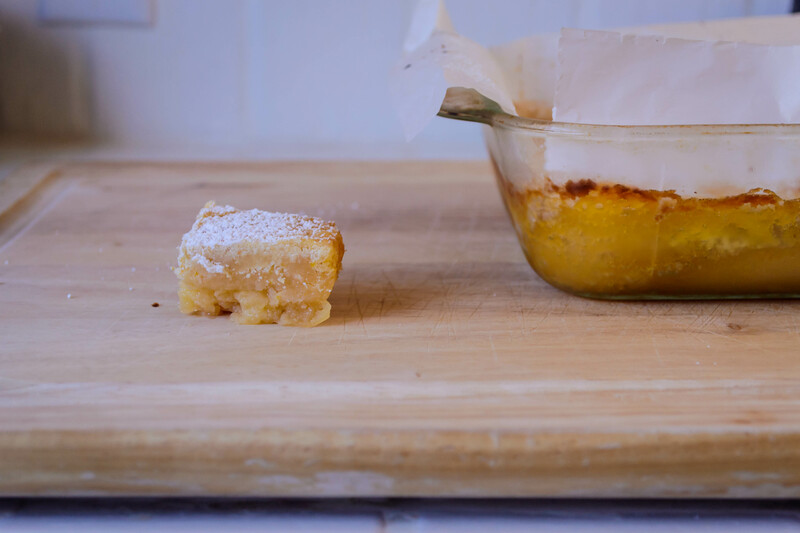 Tired of the standard, tried-and-true lemon bar, then, I set out to conquer a grapefruit version. 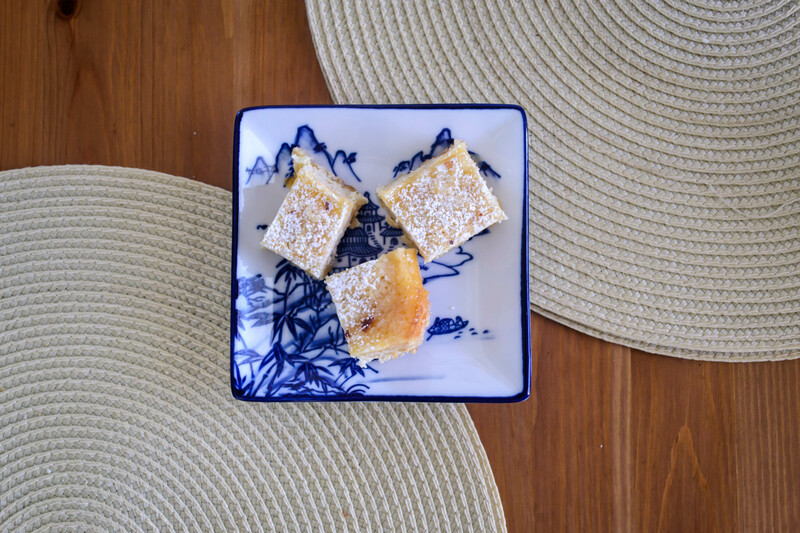 My first time through yielded highly positive results – grapefruit zest and lemon zest in the shortbread crust, just for some extra bright punch, a silky smooth custard layer of pale salmon pink, and a careful dusting of powdered sugar across the top. A few adjustments, a bit less flour, and it would be perfect. Of course, I didn’t take any photographs of this perfect little bar, because I was only experimenting. 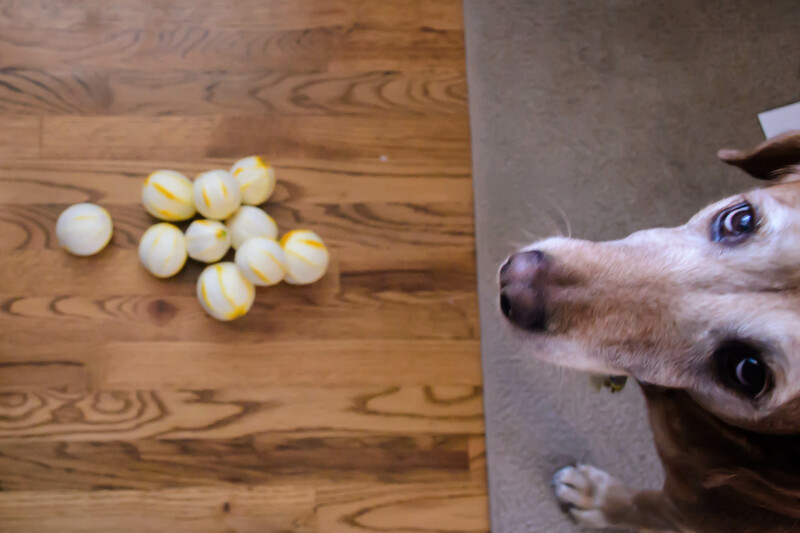 Yesterday, when I made the batch to share with you, I learned what can go wrong. 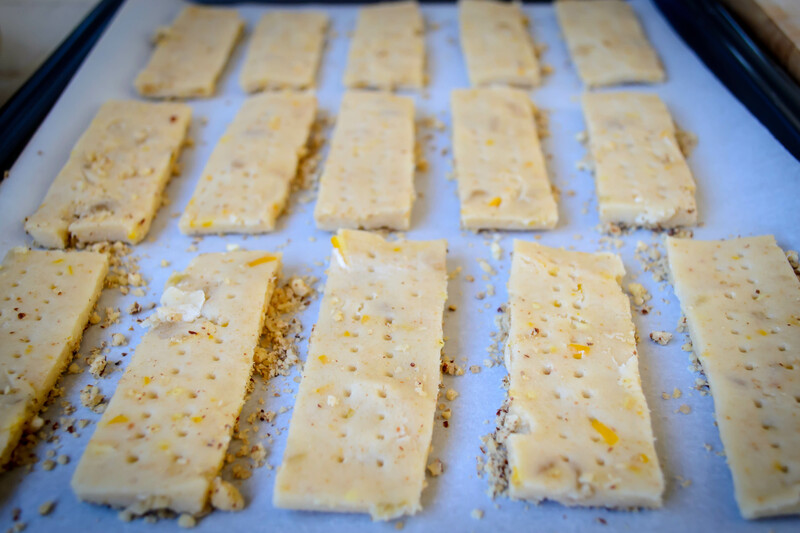 You see, the basic recipe for a fruit bar like this is to make a shortbread crust – flour, butter, sugar, a breath of salt and maybe a little flavoring agent or two – and bake it just until it starts to turn a bit golden. 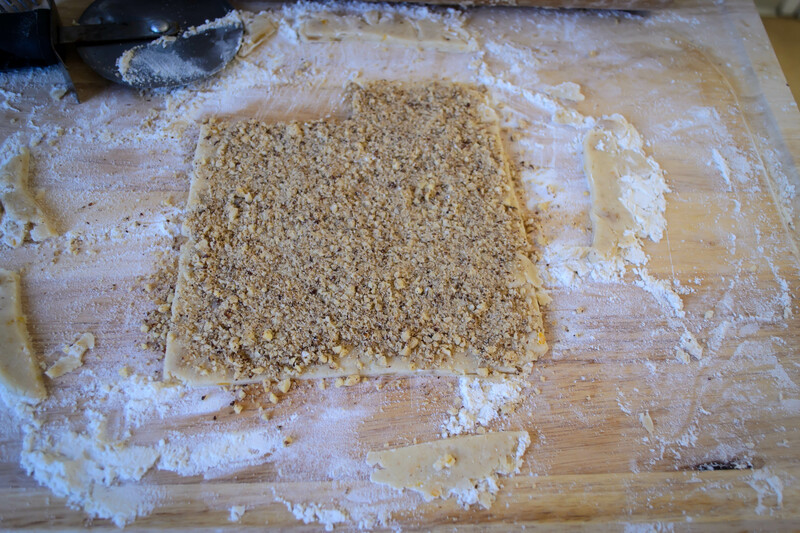 Then you let it cool a bit until the butter, now molten, solidifies to make a firm layer. 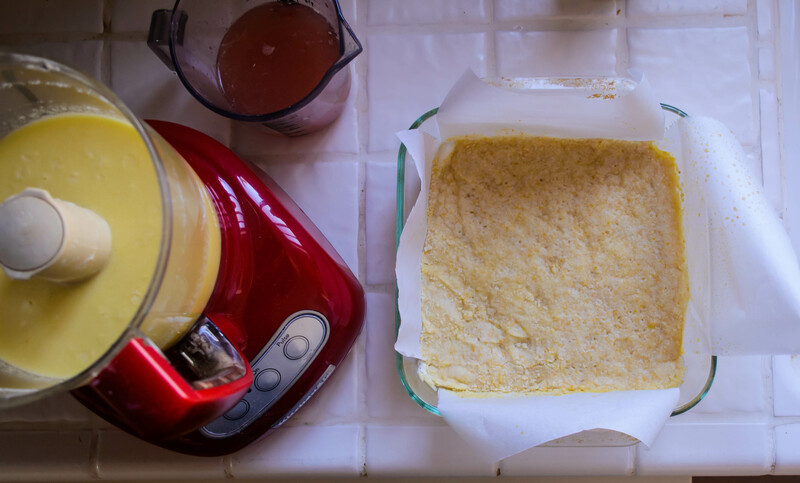 You pour on a mixture of fruit juice, eggs, more sugar, and possibly some kind of thickening agent (cornstarch, in this case), and then carefully lever the quavering thing back into the oven to cook through. The middle step – letting the crust cool – is important. Yesterday I forgot about that step. Here’s what happens when you don’t: the beautiful, pale pink liquid filling plunges straight down, bursts through the crust, and breaks it up into floating islands of mush. You despair. You yell. You say some words that make you glad the windows weren’t open. Then you put it in the oven anyway, and even though what comes out isn’t exactly what you were intending, it still looks passable and it tastes perfect. Curiously, as my grapefruit bars baked, the disrupted crust layer floated up above the (apparently) heavier “filling” layer. What came out of the oven looked more like a cake than the bars format I was expecting, but aside from making it a bit harder to cut (the grapefruit filling smooshes out as you press the blade down), they were fairly acceptable. 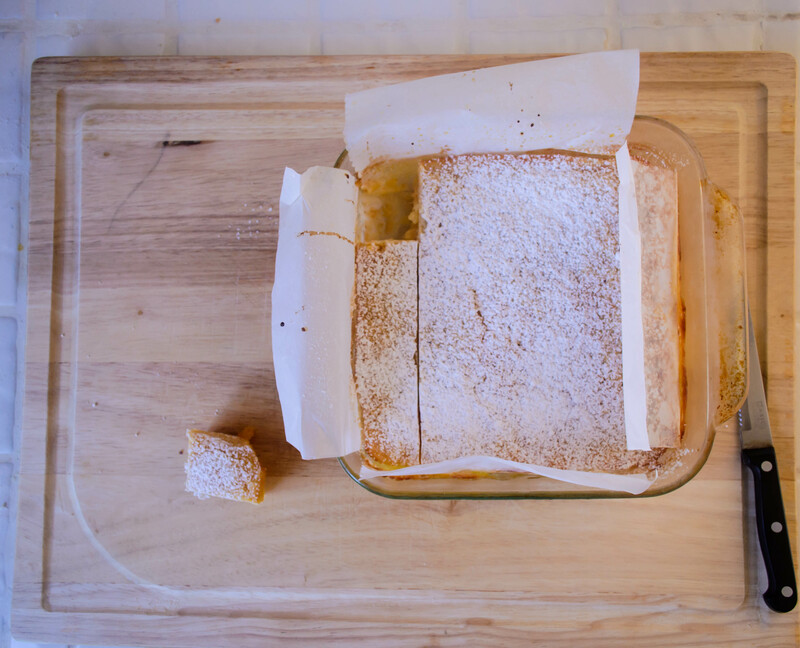 Tangy, sweet, a play of light crunch and velvet curd, and a huff-inducing layer of powdered sugar over the top to keep you from inhaling too fast. So the directions I’m providing you are what you should do. 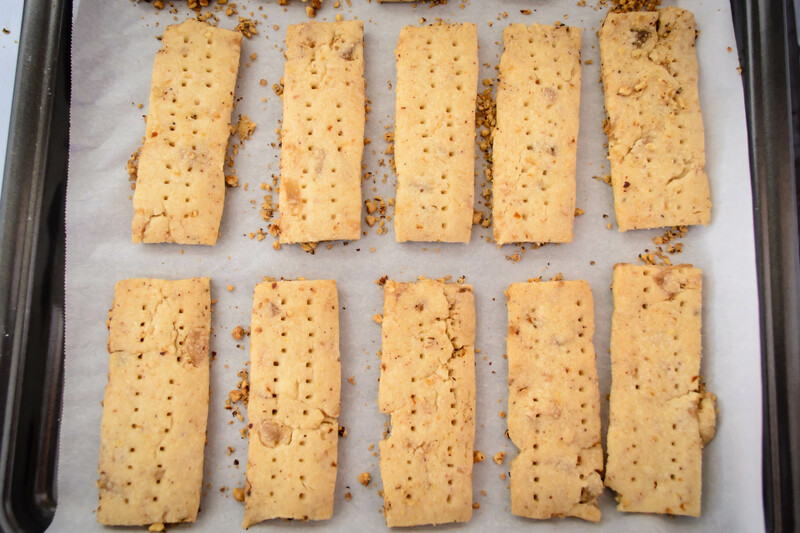 They will give you the expected format: a layer of shortbread-like crust on the bottom, topped by a thick layer of soft, slightly jiggly essence of grapefruit. Just don’t forget to let the crust cool. Unless you’d prefer, to echo the persnickety challenge of grapefruit itself, my upside down version. 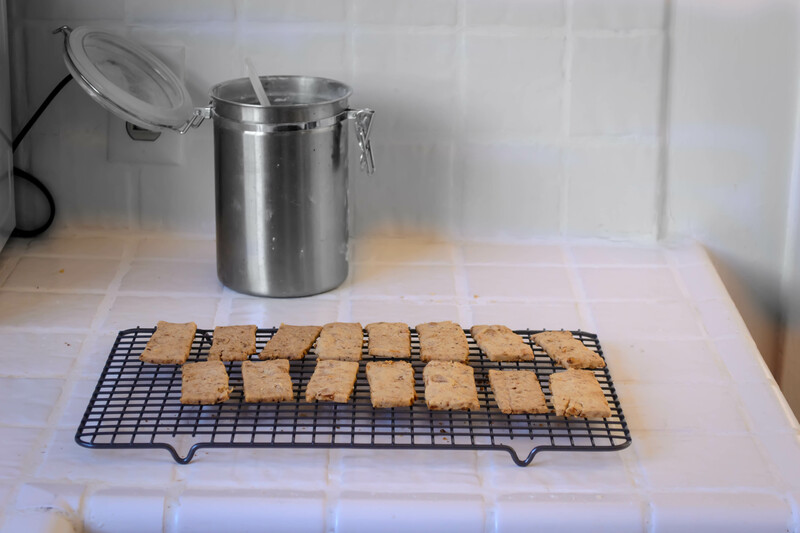 Preheat the oven to 350F and prepare your baking pan: cut two 15-inch sheets of parchment paper and arrange them in a cross shape, then insert this cross shape into a 9×9 inch baking dish with the edges hanging out. This forms a kind of sling that will help you remove the bars from the baking dish without breaking them apart. Spray the inside of the dish (including the parchment paper) with non-stick spray, for extra insurance. 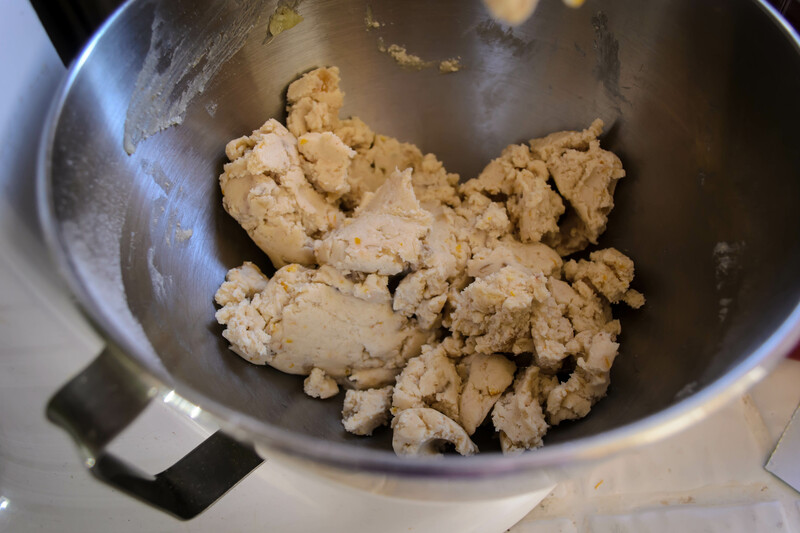 To make the crust, place the butter, sugar, flour, salt, and zest into a food processor and let run until the ingredients are combined and begin to clump together a bit. 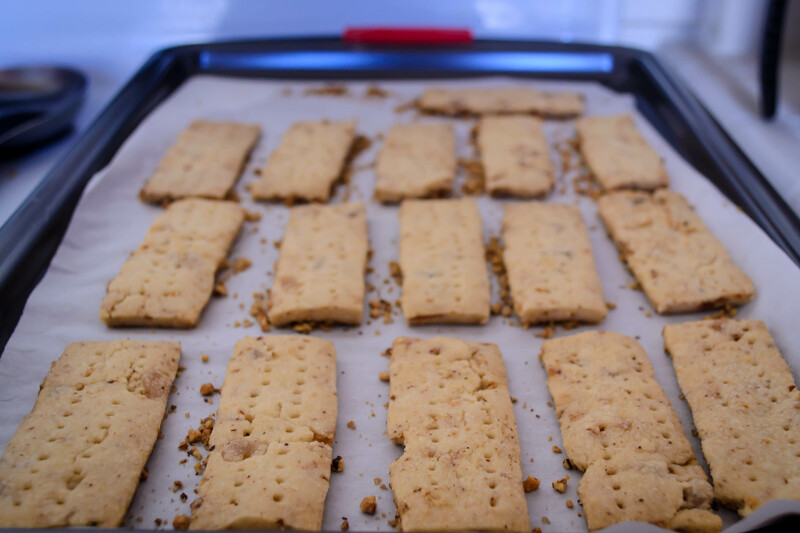 Dump and scrape the clumpy crust bits straight into the prepared baking dish, and use your fingers or the smooth bottom of a measuring cup or a glass to gently but firmly tamp the crust down into an even layer. Bake at 350F for 15-20 minutes, until it is pale golden brown and has a tender crust. If it puffs up while baking, stab it a few times with a fork to deflate it. Remove from oven and let cool for at least 10 minutes. While the crust cools, make the filling. 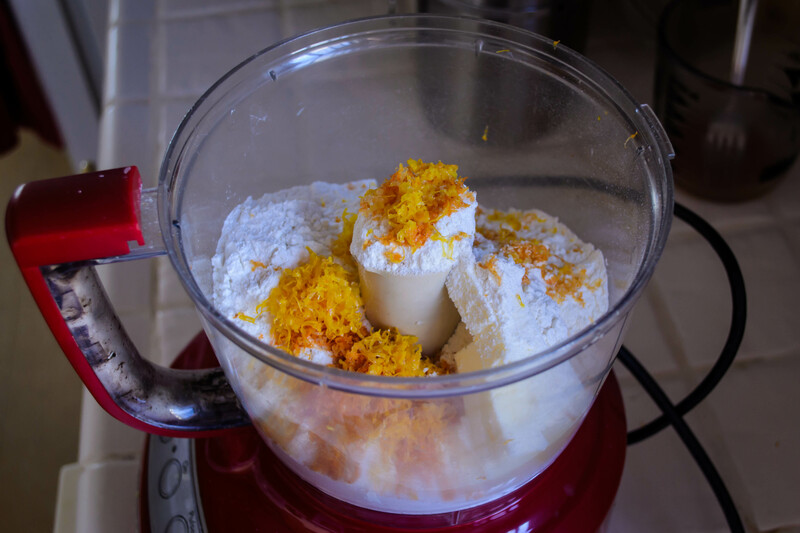 In the same food processor bowl (you don’t even have to wash it; so many of the ingredients are the same), place the eggs, sugar, butter, cornstarch, and grapefruit zest. Whiz to combine. Add the grapefruit juice and whiz to combine again. 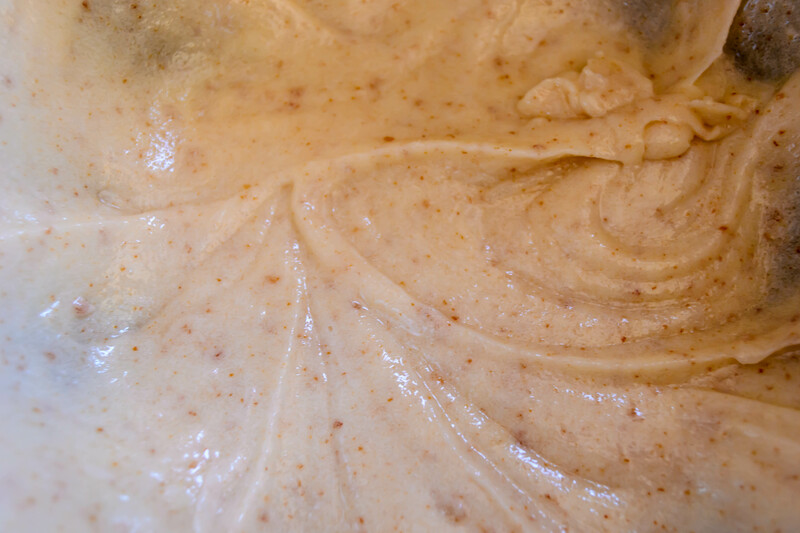 The mixture will be quite liquid and will look curdled, but it will bake up just fine. Note: there isn’t quite enough fat in this mixture to emulsify fully, which means if you leave it sitting for a while it will separate. Whir it up once more just before pouring onto the crust, or make and pour on immediately, and it should be fine. 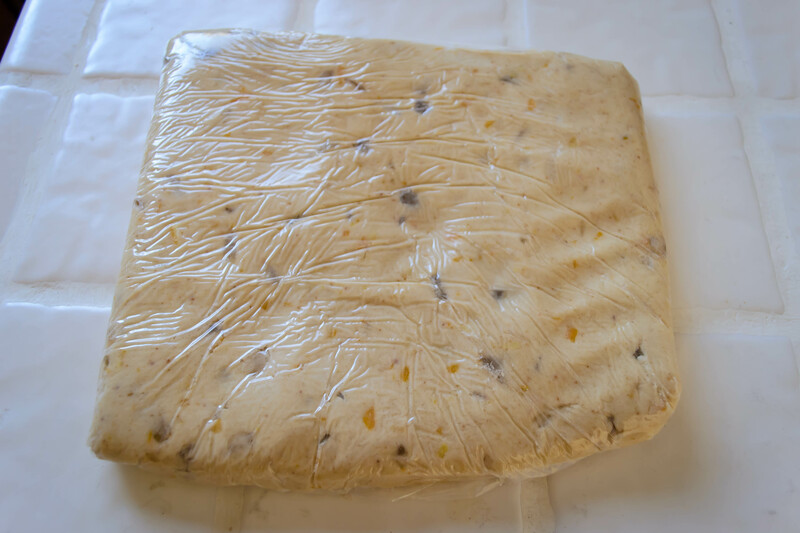 Carefully pour the filling over the crust, then just as carefully, return it to the oven (the filling will slosh around a bit if you are too hasty about this) and bake for 40 minutes, or until the filling is just set. It may leave the barest sticky bit of grapefruit-y curd on your finger when you test it. Let cool completely (seriously), then dust with a healthy layer of powdered sugar, if desired. 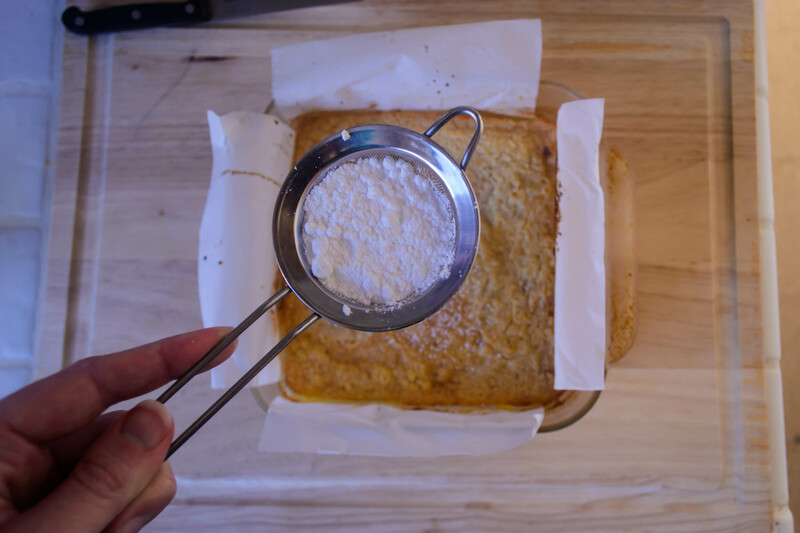 If you dust it while hot, the bars will immediately absorb all the powdered sugar. 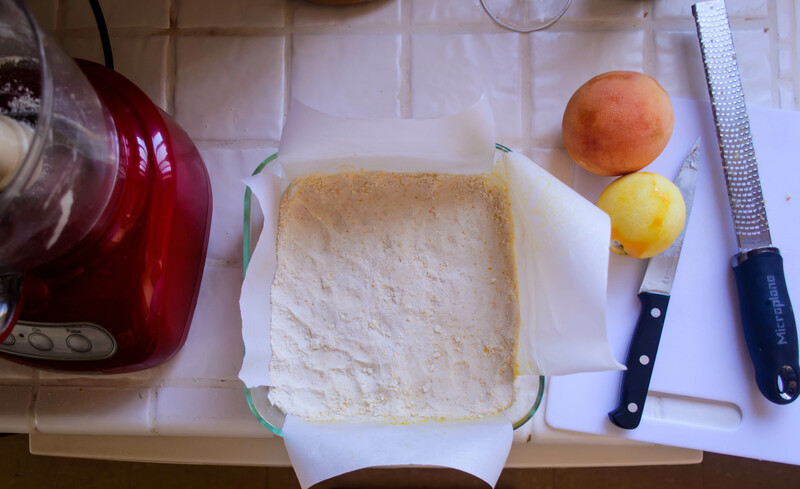 To slice for serving, use the parchment paper sling to hoist the whole square out of the baking dish onto a cutting board. Trim off the edges if you wish, then use a very sharp knife or a pizza cutter to slice into squares or rectangles of desired sizes. If the knife or pizza cutter gets gummed up along the way, dip it into a dish of hot water in between slices. Summer into fall into summer. Salads and grilled vegetables into casseroles dabbled with cream into fresh raw dips. Luxurious stretches into curled legs under blankets into stressed grading sessions into sampling new half-fizzed white wine. Sometimes this is called Indian Summer. I like to think of it as Swing Season. Two Bittmans for you this week. I’ve tasted jicama, but it has been a long time. And I’ve certainly had tomatillos, but mostly only after they were roasted and processed into salsa. I wasn’t sure how they would be raw. 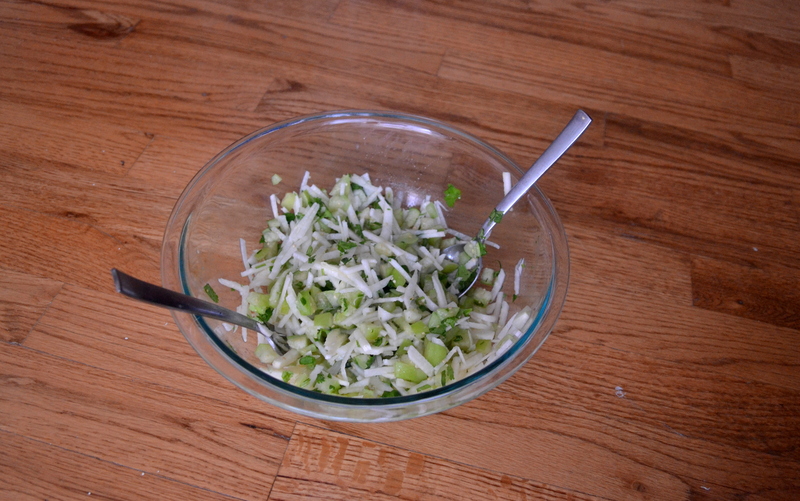 This – a lovely fresh slaw/salsa/salad hybrid – sounded so bright and tart and lovely that I wasn’t too nervous. Before anything else, I toasted the sesame seeds and set them aside. They give off such a lovely roasty scent when they are just browned and starting to release some oils. 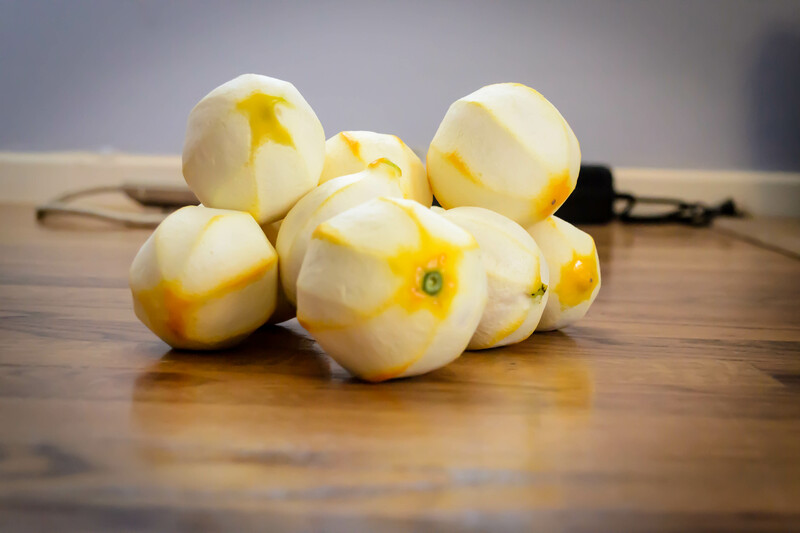 I peeled, then sliced the jicama into rounds. Then I stacked up the rounds and made thin slices across until my two little aliens were a pile of matchsticks across my board. Into the bowl with you. 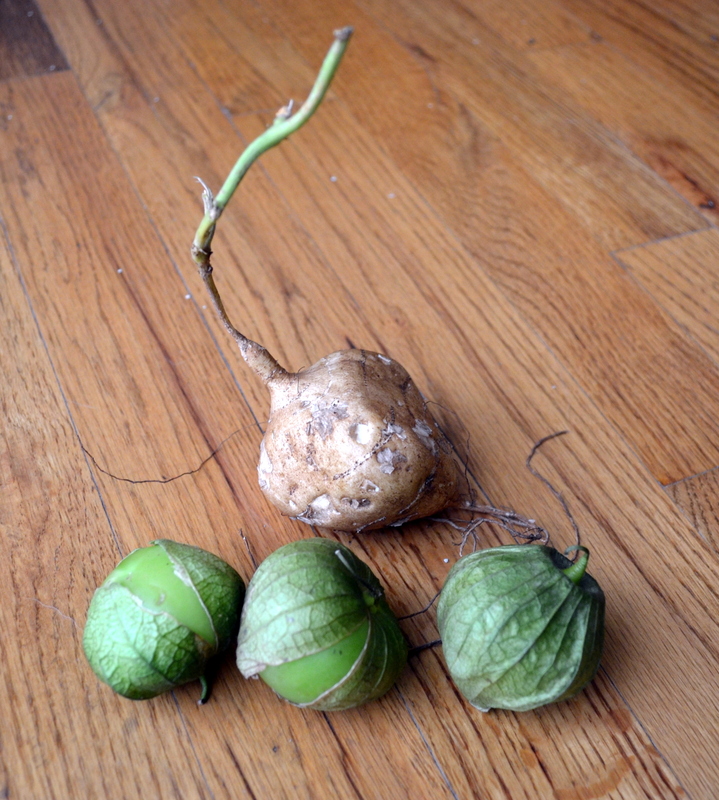 Next I quartered and diced the tomatillo. Because they are still underripe when green (apparently they can turn purple and get very sweet when they ripen, but I’ve never seen them in that state), their skins were quite resilient – it took some pressure to get my knife through them. Carefully chunked into miniscule cubes, they joined the white confetti in my bowl. A quick squeeze of lemon and lime, a whisking pour of olive oil, and a handful of chopped cilantro feathers later, and the dressing was done. And then a sprinkle of salt, and it was perfect. It was a little more than needed to moisten the salad, but it’s hard to know how much juice citrus will have secreted away inside it, so it’s always going to be a guessing game. I mounded the white and green on my plate, then added a generous scoop of Mexican rice and a quartered cheddar cheese quesadilla. Simple simple. At this point, you should ideally sprinkle the sesame seeds you so carefully toasted atop the salad, but I forgot until after I’d already subjected it to a photo shoot. I was surprised and pleased by the flavor of this dish. I can’t imagine eating it as a Thanksgiving side dish, but it was a bright burst of summer on a day that began in drizzly autumnal terms. Jicama is crisp and juicy with the barest hint of starchiness, and its flavor reminds me most closely of an Asian pear. The tomatillos were very tart, but the pairing tamed them. Imagine a granny smith apple crossed with an underripe tomato and you’re approaching the brightness we experienced. This was good as a salad, though its tartness necessitates a small portion. 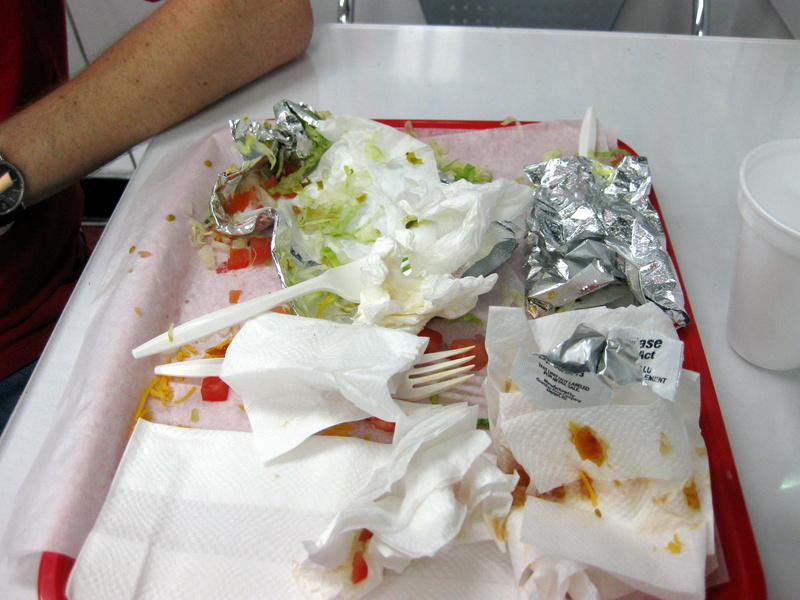 It was also good heaped atop our quesadillas, like a raw salsa. 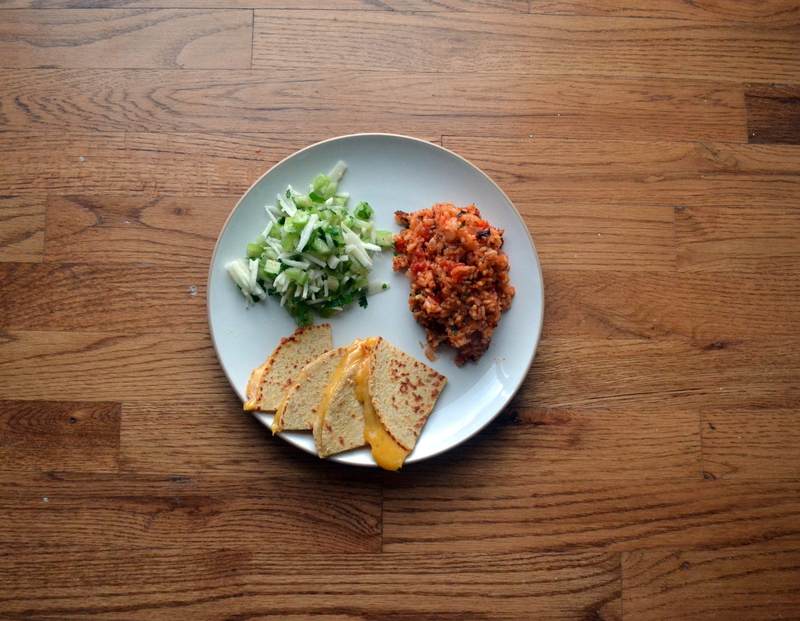 It contrasted nicely against the melted cheddar and the just crisped corn tortillas. But where it would really shine, N. and I agreed, would be as a kind of mirepoix for guacamole. Dicing the jicama instead of leaving it in strips and folding the whole salad gently into chunks of ripe, buttery avocado would make for the perfect chip dip. Tart, creamy, crunchy, with the right kind of salty sourness from the dressing, and all you’d need was a frosted Corona and a pool to dip your toes into. Summer. But things never end there. At least we hope not! Days of sweating and hiding inside and waiting till after sunset to go out always, inevitably (even if it’s taking FOREVER, Los Angeles…) relax and cool and crystallize into Autumn. 35. Pumpkin-Noodle Kugel: Cook a half-pound of egg noodles in salted water until not quite done; drain and put them into a buttered baking dish. Whisk together 4 cups milk, 4 eggs, 1 cup pureed cooked pumpkin (canned is fine), ¼ cup melted butter and a pinch each of cinnamon and salt. Pour over the noodles and sprinkle with bread crumbs (or, for added kitsch, corn flake crumbs). 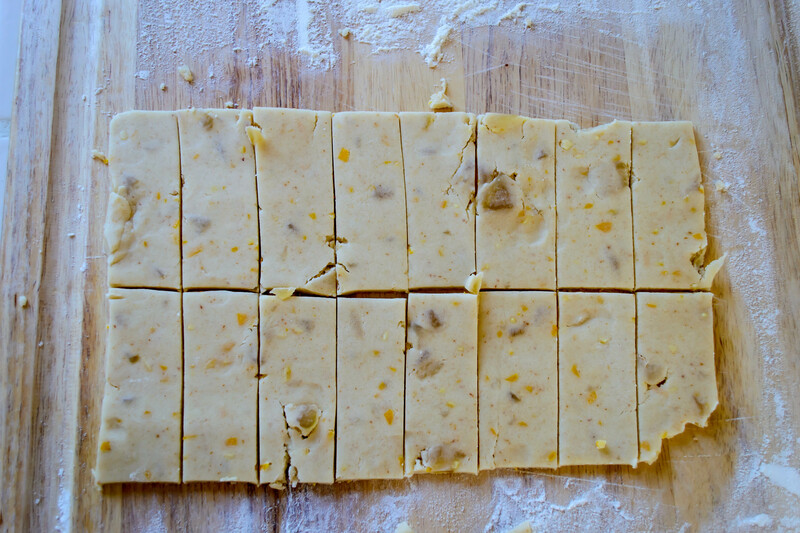 Bake 45 minutes to an hour, or until a knife inserted into the middle comes out clean. I had no idea how to serve this dish. I’ve heard of kugels, but I’ve never even eaten one, let alone made one. I wasn’t sure, as usual, what to serve it with, so I asked a few friends and did some research on the good ol’ internet. At the point that I read Smitten Kitchen’s version (okay, so this one is written by her mom, but seriously, that woman has cooked everything, and all of it sounds and looks outrageously delicious), this sounded more like a dessert than a dinner side dish. It would be, I decided, dessert and weekend breakfast. Sweet, autumnal, nicely spiced, and custardy. “It’s going to be like a rice pudding but with noodles. And pumpkin,” I told N. He still wasn’t sure. It wasn’t until I had collected ingredients that I realized Bittman’s recipe doesn’t call for sugar. But I was already on the dessert/breakfast kick, and I couldn’t quite envision this as a savory dish, so I dumped in my sugar estimation anyway, along with the golden raisins that aren’t part of the original. I cooked my noodles for 5 minutes and then let them cool for 10. They probably needed to be cooked for only 4 minutes, because they keep on cooking not only while they are in the oven, but on the counter as they cool as well. 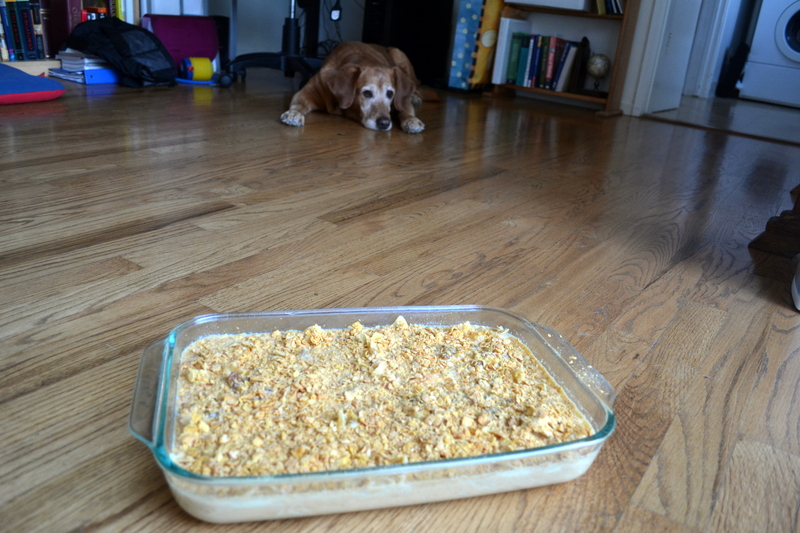 With the custard whisked together and the noodles evenly spread in a buttered 9×13” glass baking dish, I preheated my oven to 375F and assessed the corn flakes situation. 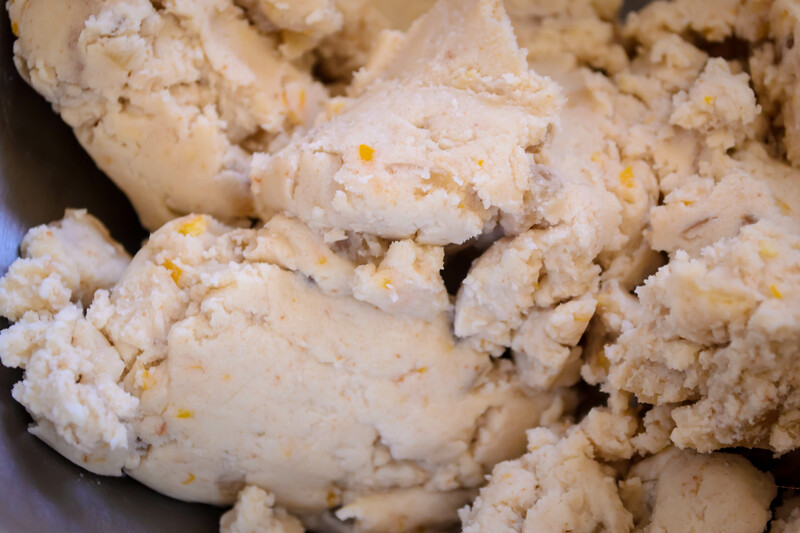 Whenever an ingredient needs to be crushed, crunched, or pulverized on Chopped, I yell at the chefs for using their hands, knives, or a rolling pin instead of just bringing over the food processor. But they don’t have to wash all the dishes they make, and I do, so my pretty little scarlet processor stayed on its shelf. I crushed up the cereal with my hands, feeling a kind of satisfaction as the flakes became bits and then powder. 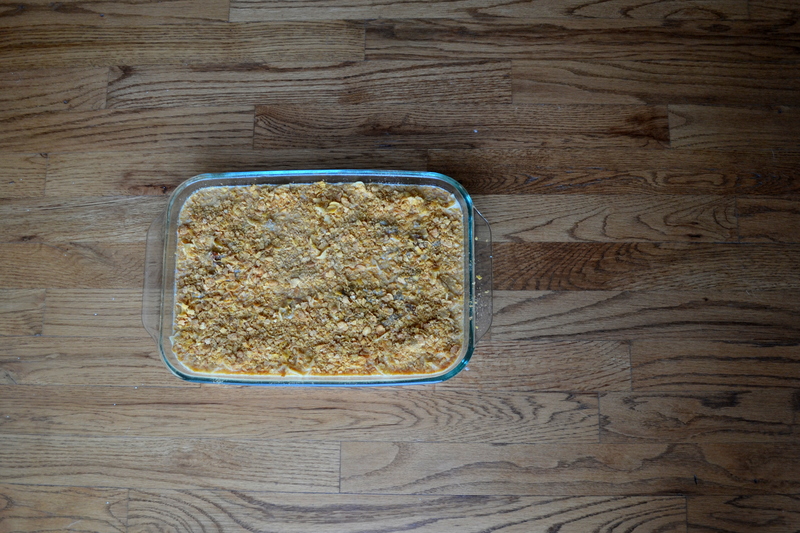 I topped the noodly custard with a generous layer of crumbs and carefully slid it into the oven. An hour later, the custard had set and the smell flashed me forward to Thanksgiving. I’m convinced we as a society don’t really know what pumpkin tastes like, because what we experience is texture and spices. If this kugel didn’t have a sprinkle of cinnamon in it, I’m not sure I would know it had pumpkin either. Dinner came and went, the kugel cooled a bit, and I dug out a too-big portion for myself, and neglected to feel any kind of remorse about it. It was too good for that. The noodles had melded together as the pumpkin infused liquid cooked, making a solid, scoopable, sliceable custard. 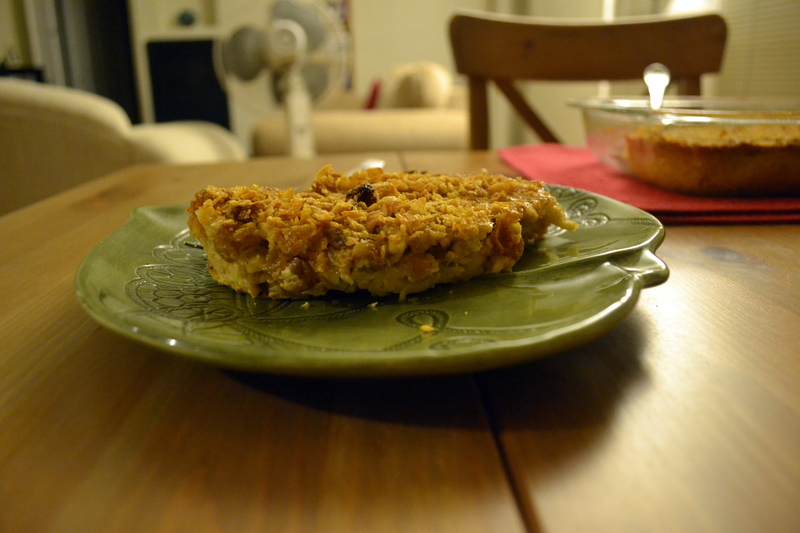 The corn flakes on top were perfect: aggressively crunchy against the soft interior. 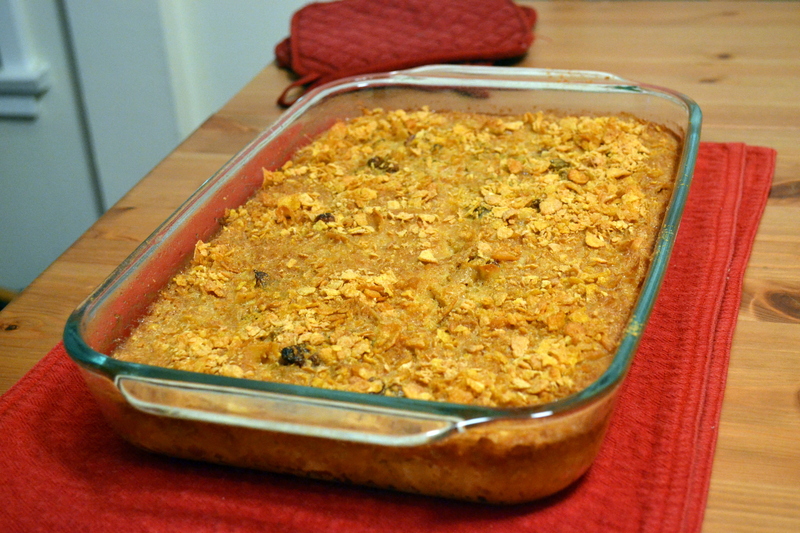 I wouldn’t omit the golden raisins either; they were a really nice textural contrast to both the softness of the noodles and the crunchy crumbs, and their complex sweetness added some depth to my dessert casserole. It was warm, and sweet, and perfectly comforting as I tucked my feet under me on the couch and waiting for the approach of Project Runway (don’t judge, every girl needs a little reality TV now and then). Last week’s reflections were a bit morose: the thoughts of a person overwhelmed and trying to settle into some kind of groove. Because while too deep grooves can become ruts, no groove at all just leaves us… squares in a hipster-filled world? Not just squares, but squares tipping and zig-zagging confusedly over an unfamiliar landscape trying to dig a corner in here and there. New home, new job, new routine, and no chances to explore yet. All that has changed. Shallow wheel marks dig in behind us. Our adventures have begun, and they began (don’t be offended) with booze. Last Friday, our dear friend J. appeared at the door, bearing duty-free Japanese whiskey from his time in Tokyo, and a phone full of bar recommendations from an associate. After a quick tour of our new digs (you guys have a backyard?! ), we set off into the night and ended up at Oldfield’s Liquor Room on Venice, where J. bought me a pre-birthday cocktail called the Blonde Comet. Bourbon, crème de peach, fresh grapefruit juice, and angostura bitters. I’m not much of a bourbon gal, but the name was too good to pass up. I like to think of myself as something of a blonde comet every once in a while… The drink was tasty. 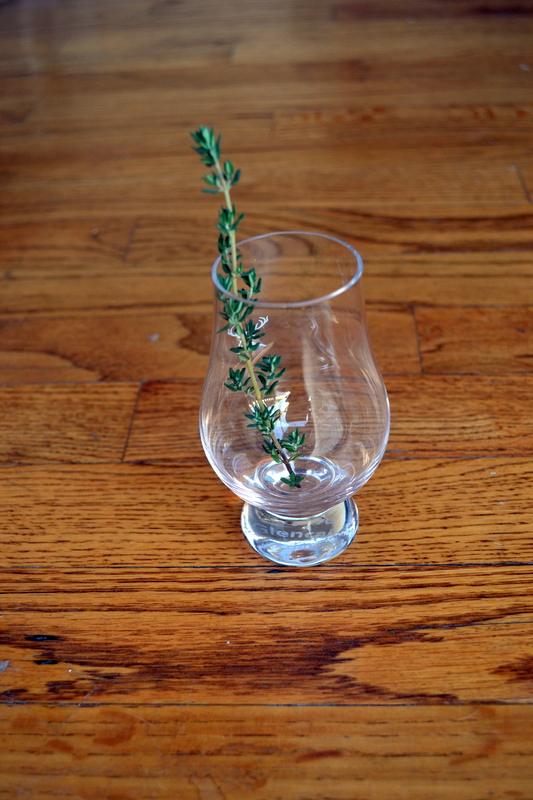 Strong, but tempered by the freshness of the grapefruit and the stem of fresh mint they plunged in as a garnish. We caught up over this first round and then decided to explore further. A quick amble down the street brought us to Bigfoot West, but it was so crowded and loud inside that not even the promise of creative whiskey cocktails could entice us. We were back in J.’s car and rolling toward Santa Monica. We ended up at The Daily Pint, where it smelled like peat and old shoes and yeast, and the impressive chalkboards full of beer options and the seemingly endless whiskey and scotch menu made J.’s and N.’s eyes shine suspiciously. I got (don’t laugh) a pint of Spiced Caramel Apple Ale that was neither as sweet nor as fruity as it sounds. J. and N. got something peaty and boggy and fiery, and I only needed a whiff to know I wasn’t interested. We settled ourselves in at a tall table next to the pool and shuffleboard stations. You must know this: I don’t like beer. When I have to, I will settle for the fruitiest, sweetest, most un-beer-like option I can find, and when I do, I like it to be ice cold so it doesn’t have a chance to taste as much like beer as I know it’s going to. As we sat and chatted and laughed, time passed and my beer warmed. Where it tasted like yeast and carbonation to begin with, as it came to room temperature the flavors got rounder and deeper, and by the time I was sipping the last half inch or so in the glass it did have some spicy apple flavors to it. I’m not sure I would order it again, but it wasn’t a bad beer, and the company and high energy atmosphere made it a good experiment. It was almost midnight when J. asked if we wanted a snack. He was thinking, he said, hot dogs or pastrami. I’ve been experiencing some cognitive dissonance when it comes to our new location – scoffing when I see patrol cars that say LAPD on the side: what are we, in a movie or something? – grinning with disbelief as I pass Warner Brothers studios on my drive home from work – but something about that night made me remember where we were. 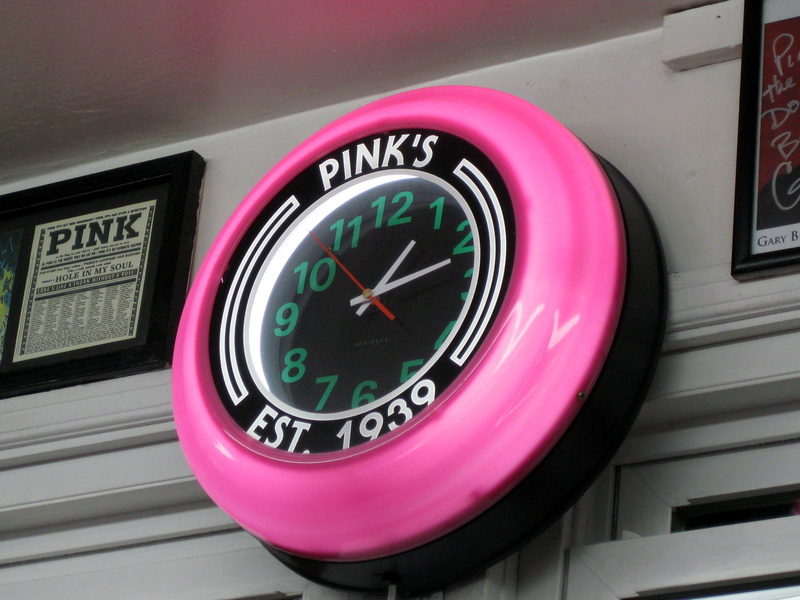 I just knew he was thinking of Pink’s. Did I want to go to the little stand with the most famous hot dogs in the state? Yes. Yes I did. At almost 1am, as my contacts screamed and the almost-responsible-adult inside me withered and gave up, we were standing in line with at least 30 other people, waiting for a hot dog. 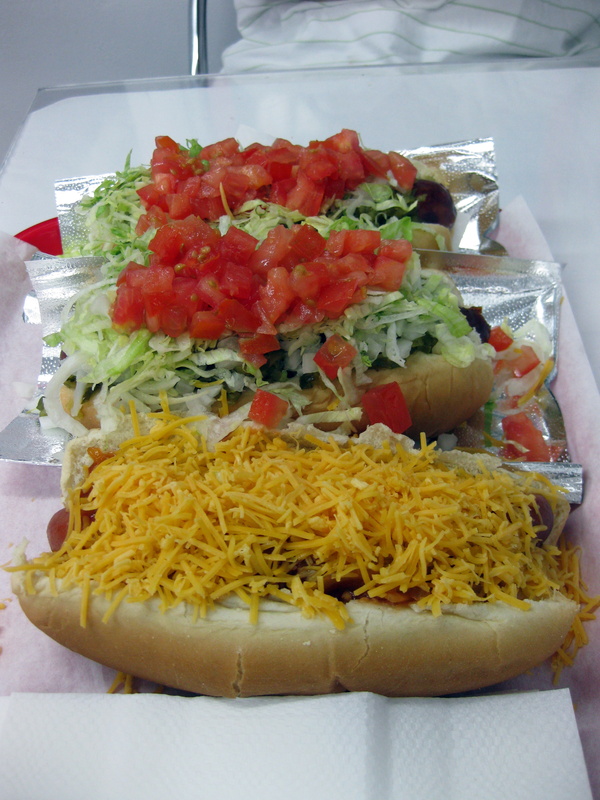 I got a New York dog – traditional hot dog topped with a sweet onion sauce – and added shredded cheddar cheese. N. and J. got Chicago dogs, loaded with lettuce, tomato, and pickle. 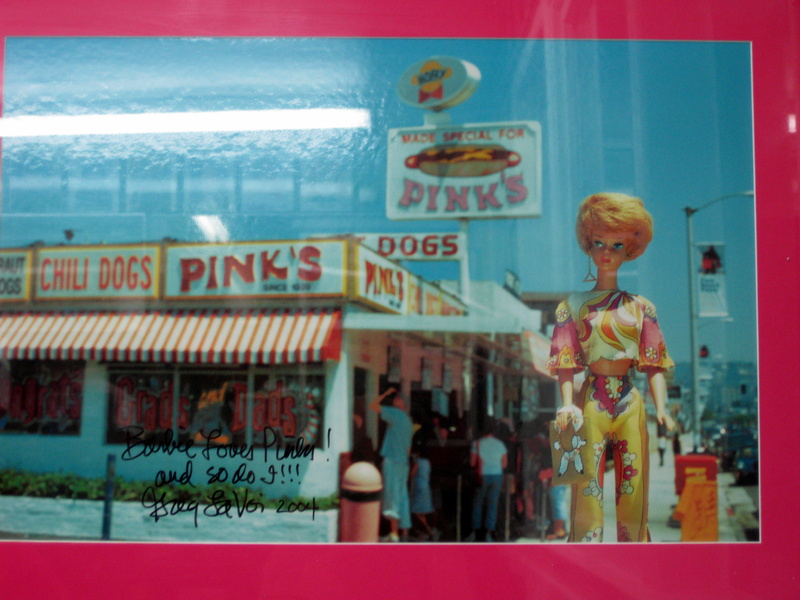 We sat at a crooked little table and took in the space: dozens upon dozens of signed celebrity photographs who had visited Pink’s, some of whom had given their names to a hot dog. 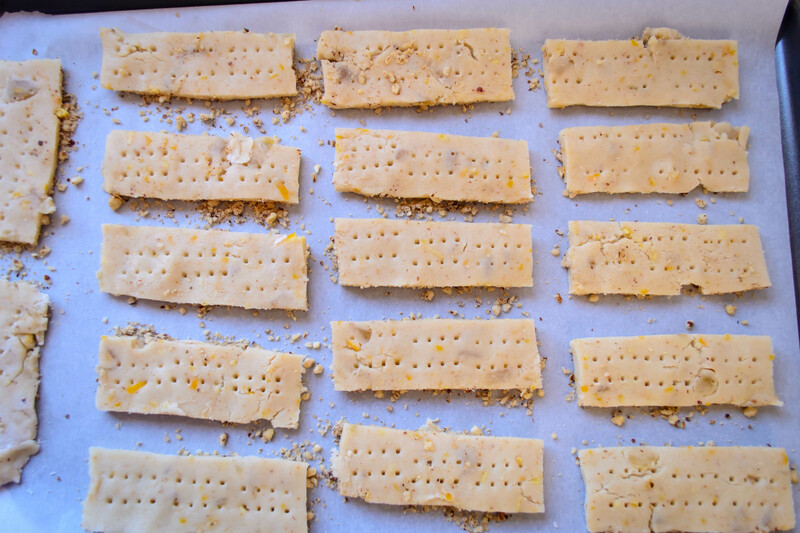 There really is no logical transition I can make to this week’s Bittman, aside from the lame play on the White Stripes song I provided as the title of this post, so let’s stop pretending and just talk about biscuits. And let’s not take our sweet little time about it. 85. Herbed Buttermilk Biscuits: Combine 3 cups flour, 2 tablespoons sugar, 4 teaspoons baking powder, 1 teaspoon salt, 1 teaspoon baking soda and 1 tablespoon thyme leaves. 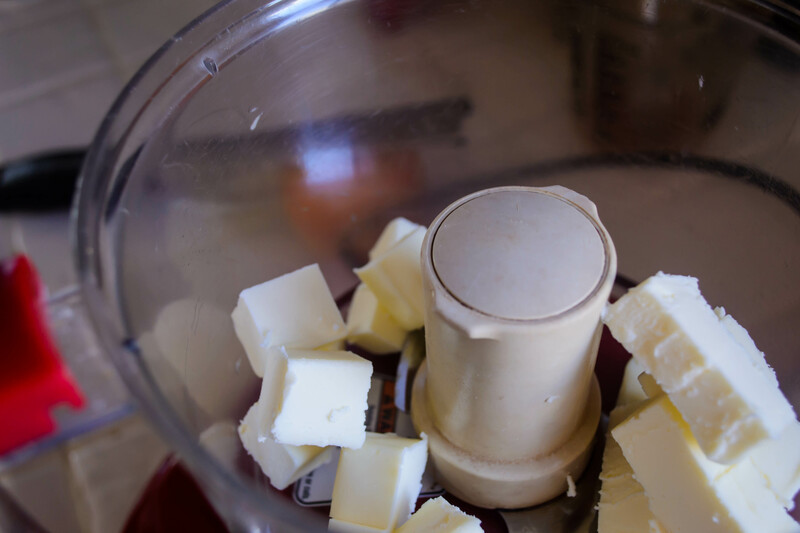 Use your fingers to rub in 1 ½ sticks of butter until the mixture resembles small peas. Add 1 cup buttermilk and stir until just combined. 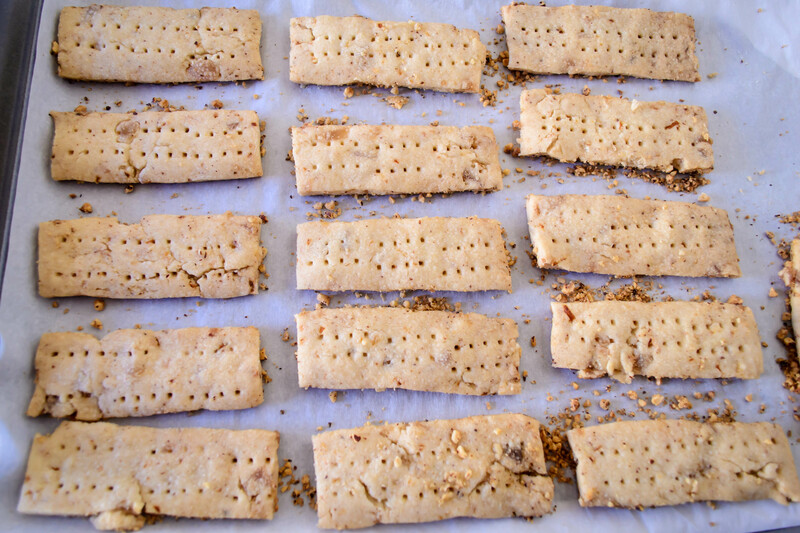 Drop large spoonfuls onto a baking sheet and bake at 425 degrees until golden, about 15 minutes. With measurements and oven temp clearly provided, I had very little to guess about or change in this recipe. Because I was using lemon in other parts of dinner, I decided on the spur of the moment to add a teaspoon or two of lemon zest to the dough to see what would happen. You could probably change up the herb used, add cracked black pepper or flaky sea salt, or even add finely chopped raisins. I wouldn’t change the buttermilk, though, as the tang it adds is entirely necessary. I even got excited tasting the raw dough, with a slight crunch from the salt and a suggestion of sweetness from the tiny bit of sugar. 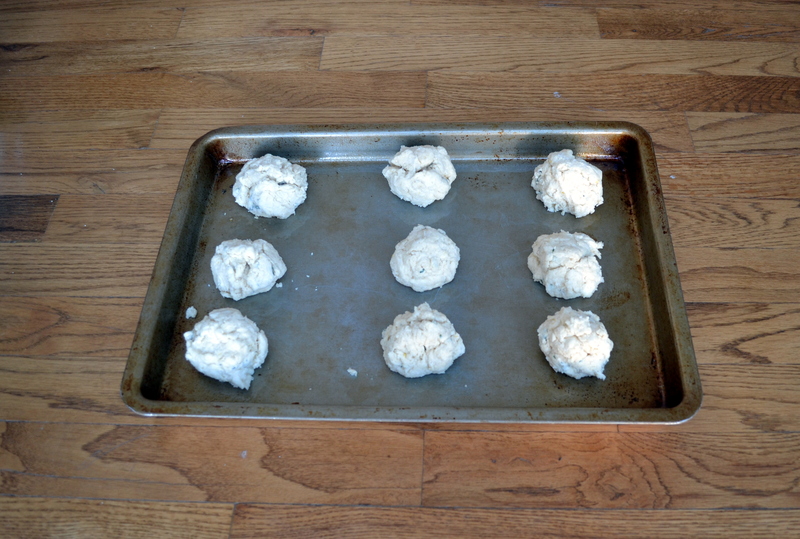 The bowl of dough produced 15 biscuits. I put nine on my greased baking tray and the other 6 on a plastic-wrap-lined plate in the freezer for another occasion. After 15 minutes in the oven, they were browned on top, slightly crunchy around the outsides, and knee-waveringly fluffy inside. Quash your fears about the amount of butter here: it really makes a worthwhile textural difference. 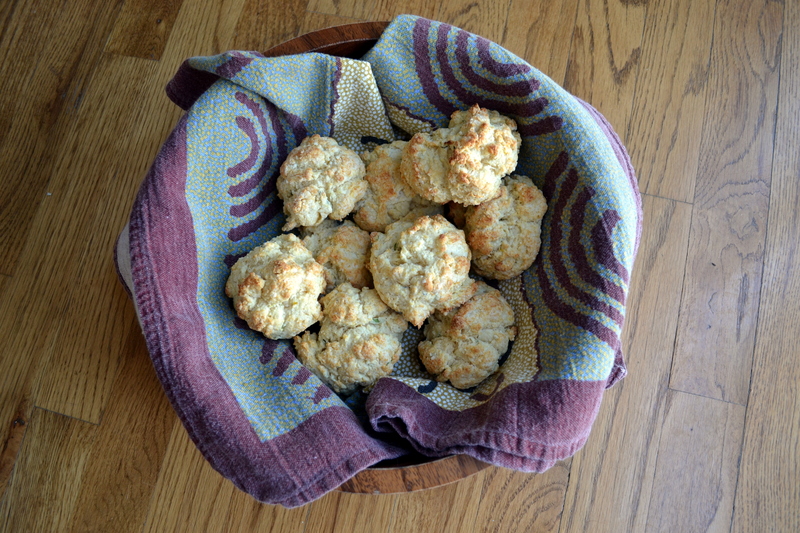 It doesn’t hurt the flavor either – these were rich but light, and the buttermilk and lemon zest added intriguing sourness that brightened the mixture and made them more interesting than your standard dinner biscuit. We ate these – no, that’s not right – we wolfed them down alongside grilled chicken sausages and grilled planks of zucchini wrapped around a mixture of goat cheese, lemon juice, thyme, parsley, and pepper. It was delightful. And here’s the delicious secret: if you end up with some leftover goat cheese mixture, and you whip in some honey, and then if you happen to split one of those fluffy delightful biscuits down the middle and perhaps toast the open sides in a toaster oven or under the broiler for a moment, and dollop a hefty tablespoon of the sweetened goat cheese on top, and eat it, you have the most delightful little end-of-summer breakfast biscuit you’ve had in years. And if you’d been out late the night before and perhaps chased some whiskey with a hot dog, a sprinkle of extra salt in the goat cheese filling would make this a quite decent hangover breakfast too, as a cure for excessive adventuring. 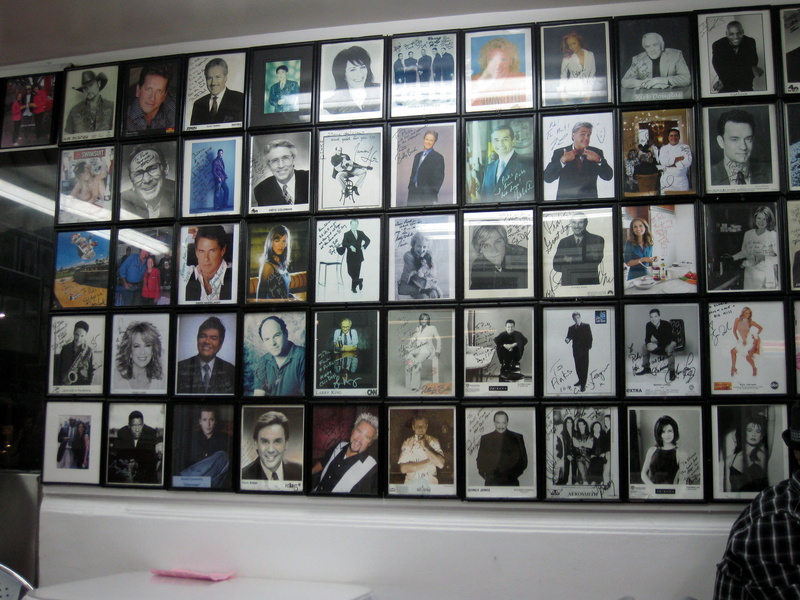 Next week we settle more comfortably into this lovely little groove we’re making for ourselves: another restaurant, another Bittman, another decade(! ), of our new little lives.